How exciting does that look, right!? Since I am not sure how long it will be before I am able to see the film myself I had two wonderful friends who offered to write reviews for the blog. A special thanks to Sari Graham and Karen L. Largent for taking the time to write their reviews to share with all of you. This was a film that I was eagerly anticipating this year. Despite having some reservations after seeing the official trailer-Mary being portrayed as having a natural Scots accent, as well as an apparent face-to-face meeting between Elizabeth and Mary-I was excited to see if this film would bring more truth to the story of Mary and her turbulent rule (read: life) in Scotland. I recently read Alison Weir’s Mary, Queen of Scots and the Murder of Lord Darnley, which cleared up a lot of the misconceptions that I personally (and regrettably,) had believed about Mary. The book was a refreshing and human insight into the woman, and much that we think we know about her is grossly misrepresented or untrue. Similar to Anne Boleyn, Mary Stuart’s reputation across history was purposely tainted and manipulated on the basis of making her appear far worse than she actually was. Both women had their faults and were by no means perfect, but also, both women were victims of the machinations of the men around them, and they both ultimately paid for it with their heads. The accent notwithstanding, Saoirse Ronan portrayed Mary Stuart very well. Her representation of the young queen lined up very much with what I read about and was expecting from Weir’s book; the Tudor stubbornness, the headstrong attitude, the self confidence that bordered and crossed into arrogance, as well as the emotional decision making process that often lead to disastrous results. You begin to feel frustrated for Mary, because it’s clear she’s fighting a losing fight for that which she believes is rightfully hers, but also frustrated at her for how she behaves when things don’t work out in her favour, and her inability to own up to the messes she frequently contributes to. Her desperation turned her into acrimonious brat; crying and lashing out with threats that she couldn’t possibly follow through on. Margot Robbie stepped into the role of Queen Elizabeth I. Though they often referred to each other as “sister” in the film, Elizabeth was Mary’s paternal first cousin once removed (Elizabeth’s paternal aunt, Margaret Tudor, was Mary’s paternal grandmother.) Margot brought more emotion but less intensity to the role of Elizabeth that I’m used to seeing, but perhaps that is because this was a version of Elizabeth that her court and people wouldn’t have seen; it was a “behind the scenes” look at the queen, and how she really felt and responded to the events happening north of her border. This was very much a view of Elizabeth the woman, and not the powerful Tudor queen exterior. You see her emotional struggles, her high highs and her low lows, and her heartbreak and grief for the things she does not and will not have. The costumes and cinematography were amazing. There were beautiful landscapes captured for the setting, and the outfits were regal and charming. Director Josie Rourke’s decision to blindly cast supporting characters-such as the English Ambassador to Scotland, Thomas Randolph, as well as Elizabeth’s lady, the later formidable Bess of Hardwick-added depth and diversity to the film which was refreshing. All in all, it was an enjoyable film. No historical film will ever be perfect, but aside from a few aforementioned reservations I had plus a few details I was hoping to see but didn’t, I left the theatre with little to criticize. I would recommend this film to any Tudor history lover, though my recommendation does comes with a suggestion; familiarize yourself with some of the major events in Mary’s rule, and some of the main players. Many people in the theatre were confused, as the events do sometimes jump around a bit, and time skips forward on occasion. Going in with a general sense of the times will help keep things clear for you. 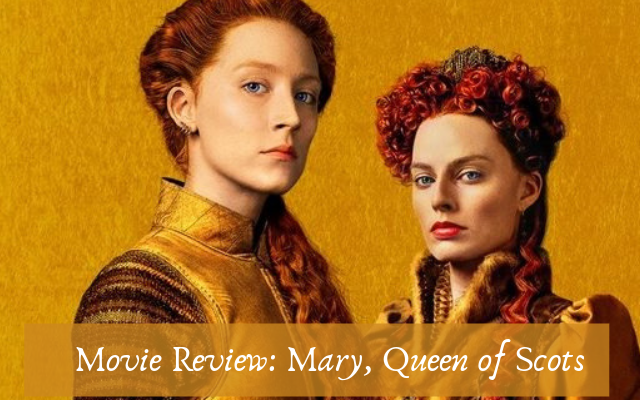 With much anticipation I recently saw the latest film about Tudor England, Queen Elizabeth I and her rival for the throne Mary, Queen of Scots. Saoirse Ronan and Margot Robbie were perfect in the respective roles and both were portrayed a bit differently than other films. Mary, the Scottish Queen, raised in France, has a slight Scottish lilt to her voice which would not have been true as she was more French than Scottish. She did speak French in the film with subtitles for those of us who are not bilingual. Elizabeth was portrayed as an emotional, frightened woman who was at the mercy of the men of her Privy Council, her advisors and her people. Mary was portrayed as stubborn, strong and a threat to the Scots rather than their Queen. Men wanted to rule and did not want to be led by mere women. The meeting between Mary and Elizabeth, which probably never happened, was the most compelling scene in the film, showing the true selves of both Elizabeth and Mary. As for the history, it was spot on for the most part, following their lives and the events that unfolded during their reigns. The costuming and cinematography were outstanding in their beauty. For any Tudor lover who is not a stickler for perfection, this is a grand film portraying the lives of two Queens whose lives were hard, sad, and amazing in what they achieved.